Well, while you were asleep last night and I was worrying about the game, a Red Sox batter hit a grand slam home run, scoring all three runners who were on base, plus himself. That put the Sox ahead of the Tigers, 5-2, and shortly thereafter, the game ended. The Sox won the American League playoffs and are now headed to the World Series, to try to become the World Champions. I know and applaud that you are a Washington Nationals’ fan first since they are your home team. But I also know that you cheer for the Sox as your second favorite team. So let me tell you a bit about what has happened this baseball season for your second favorite (and my first favorite) team. After having one of the worst seasons ever last year, only winning 69 games while losing 93 and finishing in last place, everyone thought this year couldn’t be worse. They were right. But no one, except your Auntie Elizabeth, expected the Sox to have a great year. And certainly, no one, except your Auntie Elizabeth, ever thought the Sox would make it to the World Series. Between last season and this season, the owners and management of the Red Sox made some important changes. They brought in a new manager, they added some seasoned players who cared more about winning as a team than their own individual statistics (ask Brandt what that means), and they had a well balanced team, good starting pitching, good relief pitching, good hitting, good fielding, and good base running. They had older players, ‘middle-aged’ players and a few young ones too (just like you know who on the Nats). They made a trade for another player, a pitcher, near the end of the season. But the most important factor in their making it to the World Series this year was how the team got along as a group, how they played together, how they supported each other, how different team members at different times during the season ‘stepped up’ and ‘came through’ with a hit, a home run, a well pitched game, good relief from the bullpen, and good defense when they were in the field. No one was the hero all the time. No one was the single reason they won. 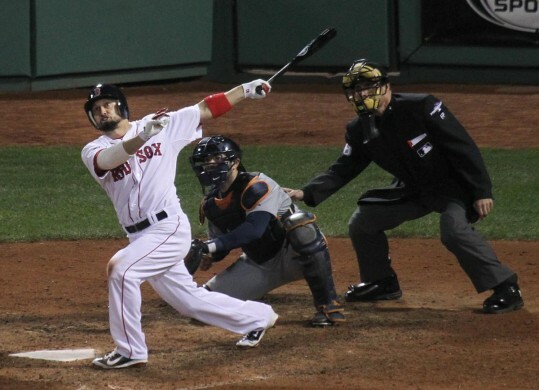 At various times, the littliest guy on the team, Dustin Pedroia, was the leader. At other time the biggest player on the team, David Ortiz, was the leader. Some times they won because the players in the field made wonderful plays. Some times they won because they stole bases. Also, they never gave up, even when they were behind in a game. And when they did lose, they never got discouraged. They just came out the next day, knowing they had another chance to win. They always seemed to believe in themselves. But mostly they won because they didn’t depend on any one player to carry them through the season. Each player ‘stepped up’ at various times to help the team and lead them to a particular win. In the playoffs this week, the Tigers had better pitching, the best in all of baseball. They held the Sox hitters to a very few hits, and they struck out a record number of Sox batters. But the Sox did something smart. They took their time. They made the Tigers’ pitchers work very hard and get tired. So towards the end of the games, the Sox were able to get important hits, two grand slam home runs, that helped them win. And they also did all of the small things that are important – ran the bases well, fielded well, stayed alert, never gave up, and never looked too far ahead, They prepared for each game, studying the other team’s weaknesses and looking for ways to equalize the strong pitching and hitting of the Tigers. I can’t promise you the Sox will win the World Series and be declared the best team in baseball this year. We’ll have to wait and see what happens over the next seven games with the St. Louis Cards, the team they will play. The Sox and the Cards are the two best teams in baseball this year. They each won 97 games and lost only 65 games. So the World Series will between the best two teams in all of baseball. You once asked me if it’s OK to lose. Or maybe you asked about having to win all the time. My answer is that it’s usually better to win than to lose. But no one can win all the time. Both the Cards and Sox have had a wonderful season this year. No matter who wins the World Series, they will be the two best teams in baseball for 2013. PS – Abby and Ryan aren’t quite old enough to understand everything in this letter, but I hope you will explain to them, when they are able to understand, about the 2013 baseball season. This is a great letter from a Grandpa to his Grandson. It is full of wonderful values that matter so much to all people in all walks of life. I am sure your family will treasure this for a long time. I hope though that Eli can see through the smokescreen of your descriptions to see that there was an underlying current of competition, not often talked about in the news. It was about the beards and who had the most testosterone. Ultimately, those with less hair were the true men of the team! The off season should be a real test of their unity, should they get by the smoothe shaven Cards. What great lessons for your grandson. He will always remember your letter. Eli, the most important lesson in all of this should be clear: Listen to your auntie. She knows best! Eli, before you believe what your Auntie says, take some time to evaluate how my life turns out. If you don’t like what you see (which I suspect will be the case), then run from her.